International Bible Christian Fellowship (formerly known as Community Bible Fellowship) recently hosted a yard sale to raise funds for famine relief in the Horn of Africa. Combining church donations and sales, our church was able to raise close to $1,700. The cost to feed a family for a month is $60. With our $1,700 donation, we have helped World Concern feed 28 families! Many thanks to Chris Sheach of World Concern for educating us about the devastation in Africa, and the Evans family for coordinating the event. 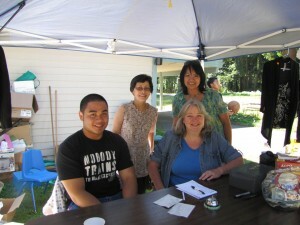 Read more from World Concerns’ blog post about the yard sale. World Concern is a Christian humanitarian organization working to lift people out of poverty thru disaster response and community development. As an organization, we strive to be transparent and effective in how we help, this blog is a lens into our work.